These pages give non-technical information on how to prevent respiratory disease from working with poultry and tell you where you can get further help, if you need it. 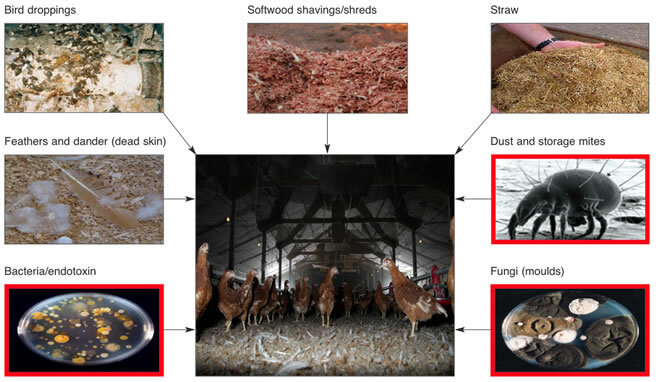 Poultry dust is a mixture of bird feed, bedding material (eg wood shavings/shreds or straw), bird droppings, feathers and dander (dead skin), dust mites and storage mites, and micro-organisms such as bacteria, fungi (moulds) and endotoxins (cell wall components of bacteria). Respiratory disease (a disease affecting our lungs and breathing tubes) is a major occupational health risk for people working in agriculture. The number of occupational asthma cases is double the national average. Studies have shown that poultry workers exposure to poultry dust can be substantial. Workers with occupational respiratory disease may develop permanent breathing problems, becoming disabled, and unable to work. This not only affects individual workers, but has wider cost implications for employers and the poultry industry as a whole. Respiratory diseases are preventable. There are simple, cost-effective steps employers and workers can take to avoid respiratory disease at work, using the avoid, protect and check approach and following the guidance set out in Controlling exposure to poultry dust: An occupational hygiene standard of good working practice for poultry farmers. Which activities generate poultry dust? Populating poultry houses with young birds. Routine crop maintenance and cleaning. Cleaning poultry houses after depopulation (final clean). Spreading straw/wood shavings by hand. Mechanical chopping and spreading of straw and wood shavings. Placing out trays of day-old chicks into growing sheds. Transferring point of lay hens from wheeled modules into cages/open barns. Using an air blower to clean down battery cages, walls, floors and machinery. Using a brush to sweep away debris. Using a brush to clean cages. Herding birds into a penned area. Walking through birds to check for bird welfare. Using a mechanical bucket to scoop, scrape, pile up and tip litter. Using a shovel to remove litter from around the base of roof supports and other awkward areas inside a poultry house where a mechanical bucket cannot reach. Using a blower to remove litter from around roof supports/extensions. Using a mechanical rotary brush to sweep up the floor. Using compressed air to clean extraction fan and casings. Using compressed air to blow down poultry material at a high level. Our respiratory or breathing system includes the mouth, nose, lungs and the tubes that connect them. Occupational respiratory disease is a medical term used to describe diseases caused by, or made worse by, something you breathe in while at work, eg poultry dust. You can also get flu-like symptoms with headache, fever and muscle aches. If you suspect you may have a respiratory problem, report your work-related symptoms to your employer and visit your doctor for advice and treatment if needed. The NHS also has useful information and advice on respiratory disease (asthma, aspergillosis and breathlessness), along with other associated non-respiratory disease (rhinitis and conjunctivitis). 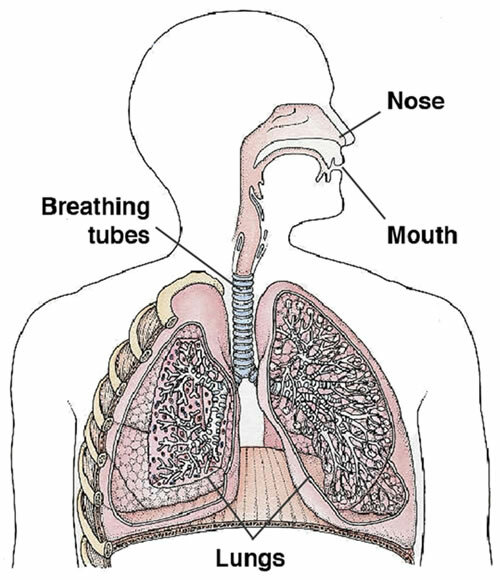 Some occupational respiratory diseases affect the tubes that carry air in and out of the lungs (our airways). Occupational asthma is an example of this sort of problem. It is caused by an allergy to something in the workplace, eg poultry dust. This type of allergy usually takes several months or even years to develop, and may also cause eye and nasal symptoms at work. Occupational asthma causes the airways to swell and tighten; leading to symptoms of coughing, wheezing, chest tightness or breathlessness at or after work. If these symptoms are better on non-work days (like weekends, rest days or holidays) then occupational asthma needs to be strongly considered. As well as causing asthma, working with poultry dusts can also worsen symptoms in people who already have asthma. It is much better to prevent respiratory disease by using good working practices. Follow good working practices set up by your employer. Report symptoms of respiratory ill health to your employer. If you are concerned, see your doctor. Wear the correct Respiratory Protective Equipment (RPE) for the job (eg dust masks; air-fed hoods, visors, helmets etc). If you use RPE which relies on a good face seal to be effective (eg disposable dust masks, half and full-face masks), then your respirator must be face-fit tested. Facial hair affects the performance of close-fitting respirators, so faces should be clean shaven for the best performance. Ensure you know how to wear your RPE correctly. Check the fit of your RPE before use. Follow the manufacturer’s fitting instructions on how to correctly put on the RPE and check the fit. Don’t remove your RPE during the work activity. Wear the RPE all the time when working in a dusty area. Don’t lift the RPE away from your face to talk or to take a deep breath while doing the job, you will lose the protection. Your staff need to know about these simple steps. Further information and tools for you to inform and train workers are available in the resources pages. Finally, check regularly that all these actions are carried out in practice.